Jamie at The Perpetual Page-Turner has again created an end of 2011 survey to reflect on this years best and worst reads. I had a lot of fun with this one last year, so of course I was excited to see that she brought it back this year. This survey includes books I have read this year, both old and new. It is not a survey that rates 2011 releases. This one is hard. I read a lot of amazing books this year. Three titles immediately come to mind when I think back to the "best" books; Norwegian Wood, Middlesex and them. Of those three, the one that stands out the most for me is Norwegian Wood by Haruki Murakami. On the surface Norwegian Wood is a love story, a very organic one at that. But it's really much more than just a love story. It's about memory and the memory of love, and how it stays with us even when the one we love is gone. It's about coping with death and sorrow, and understanding life while trying to find your place in this imperfect the world. It's about loneliness and isolation and the innate human desire to form unique relationships. I've got to thank Ben from Dead End Follies for recommending this book to me. The Weird Sisters by Eleanor Brown: I wish I hadn't wasted my time and finished this one. How I Became A Famous Novelist by Steve Hely: I picked this book up after Jackie at FarmLane Books recommended it. I thought I would like it, but I was surprised by just how much. I read this one in two days, laughed out loud quite a bit (which is something I rarely do when reading, or even watching a movie) and recommended it to a handful of bloggers. The Night Circus by Erin Morgenstern: This book had enough hype surrounding it that I didn't really need to push it on anyone, but I did recommend it to my mom, my sister and some friends. It's got such universal appeal that you can't really go horribly wrong by telling people to read it. The Wonderland Quartet by Joyce Carol Oates: To be fair I've only read one of the books in the series, but it was so good I already bought another and plan to read it soon. Jeffrey Eugenides: Yes, I only just discovered Eugenides this year when I read Middlesex in May for the Back to the Classics Challenge. Joyce Carol Oates: Oates is absolutely astonishing. I can't wait to read more of her work. Jhumpa Lahiri: It took me awhile to pick up some of Lahiri's work but once I did I immediately knew why she won the Pulizer. 7. Most thrilling, unputdownable book in 2011? The Thieves of Manhattan by Adam Langer: This one was easy, it was the only novel I read in under 24 hours this year. It was awesome. 8. Book you most anticipated in 2011? The Marriage Plot by Jeffrey Eugenides: If you followed me on twitter near the end of the summer I wouldn't shut up about how excited I was for the book. I may have also posted about that a couple of times. 9. Favorite cover of a book you read in 2011? 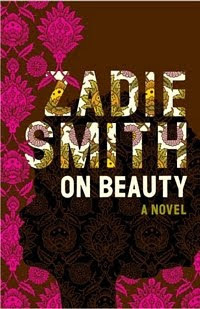 On Beauty by Zadie Smith: I found this beautiful hardback edition at Half Price Books and scooped it up immediately. The picture doesn't really do the cover justice. It is made up of all these lovely patterns and textures. 10. Most memorable character in 2011? Midori Kobayashi from Norwegian Wood by Haruki Murakami: This girl is bananas, in the best and most sincerely possible way. 11. Most beautifully written book read in 2011? The Painted Veil by M. Somerset Maugham: Maugham's writing is truly lovely and his ability to convey ideas without hitting the reader over the head with them is refreshing. 12. Book that had the greatest impact on you in 2011? The Submission by Amy Waldman: If you are looking for a book that will challenge your notions of post 9/11 America, I ask you to let The Submission be it. 13. Book you can't believe you waited UNTIL 2011 to finally read? Slaughterhouse-Five by Kurt Vonnegut: I've been a long-time fan of Vonnegut's short stories, but I didn't pick up Slaughterhouse-Five until this year. 14. Favorite Passage/Quote From A Book You Read In 2011? 15. Book That You Read In 2011 That Would Be Most Likely To Reread In 2012? The Marriage Plot by Jeffrey Eugenides: I was so excited to get my hands on this book that I cruised through it in a couple of days. I'd like to reread it and take my time with it the second time around. 16. Book That Had A Scene In It That Had You Reeling And Dying To Talk To Somebody About It? (a WTF moment, an epic revelation, a steamy kiss, etc. etc.) Be careful of spoilers! This is a tie between the ending of The Marriage Plot and the second half of The Thieves of Manhattan. I am both excited to hear Norwegian Wood is so good, and bummed that you already read it so you can't read it for the first time in the January readalong. ALSO I read Middlesex this year and it was just completely kickass, right? Daaaamn, Eugenides, you totally made up for The Virgin Suicides being not-that-good. Oh Midori is so bananas and I heart her face. Norwegian Wood was one of the best books I read this year and a lot of that credit goes to her character. You discovered a lot of great authors this year! The Marriage Plot was definitely my most anticipated book this year too! What a great meme! I'll definitely do this in a few days when I have more time. But oh you've made me add more titles to my list (Thieves of Manhattan, Wonderland series, etc..). Norwegian Wood is one of my favorite Murakami novels (I was so disappointed in IQ84) and I'm rereading Cat's Eye now. Love that quote! What a brilliant list of books, I can't beleive how much great stuff you read!!! Great year end wrap-up! I've been trying to think of some unique way to wrap up my own 2011 reading endeavors... Apparently, I need to earmark The Marriage Plot (loved Middlesex) and Norwegian Wood for reads in early 2012. Great answers. I'm so glad you loved Middlesex, such a good book! I really need to read Norwegian Wood next year. Also, I love Lahiri's work and I just found out she's coming to speak in Indy this spring. So looking forward to that. WooWoo! Norwegian Wood!! That was one of my favorite books that I read in 2011 as well. I also read The Marriage Plot last weekend. I LOVED it! I also have On Beauty next to my bed, that I bought because of your review. I'm also a big fan of Somerset Maugham, Kurt Vonnegut, Margaret Atwood, and Joyce Carol Oates. I think we have very similar taste in books. Go us! How I Became a Famous Novelist surprised me in a good way too! I also loved many of the books you mention. I haven't tried Oates yet, but I own a few of her books so have no excuse. Hopefully I'll discover how amazing she is in 2012. Another reminder that I absolutely must read Night Circus...and soon. Excellent choices, and I love the question/answer format. Might have to jump on this one!!! This post is great and it really just takes me back to last year when I completed it myself. I'm pretty stoked about the most unputdownable because I picked up a copy of TTOM last week. The amount of books you've read this year is pretty impressive-- congrats! I'm really looking forward to picking up JCO because of you. Thanks! 1I loved Norwegian Wood when I read it! That particular cover of On Beauty is really beautiful. Happy New Year! I keep meaning to read something by Lahiri. I don't know what I'm waiting for.